You can apply multiple animation effects to a single string of text or an object, such as a picture, shape, or SmartArt graphic. Tip: When working with multiple animation effects, it helps to work in the Animation Pane, where you can see a list of all the animation effects for the current slide. 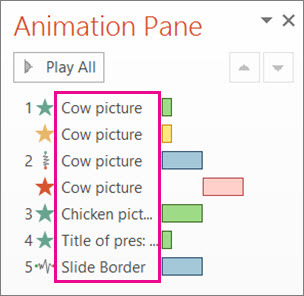 Select the object on the slide that you want to animate. Click Add Animation, and pick an animation effect. 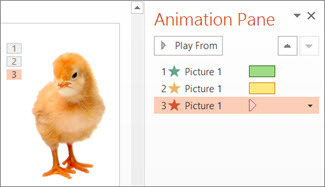 To apply additional animation effects to the same object, select it, click Add Animation and pick another animation effect. Important: After applying the first animation effect, if you try to add more animation effects any other way other than clicking Add Animation, you won’t apply an additional effect. Instead, you’ll replace the existing effect with a the one you’re adding. 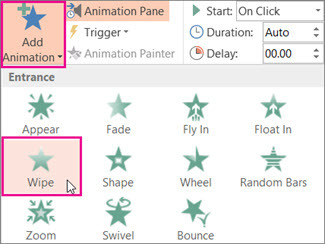 In the Animation Pane, click the down arrow next to the animation effect, and then click Timing. To play when you click the mouse, pick On Click. 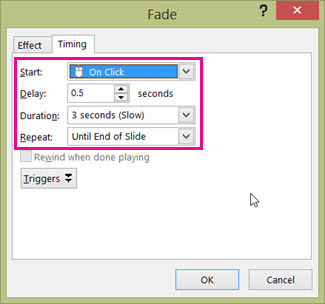 To play after the previous animation effect plays, pick After Previous. 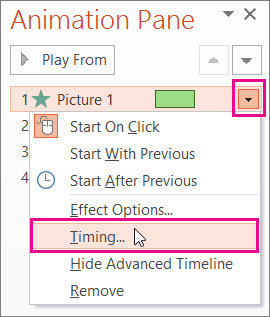 Tip: The previous animation effect is the one listed in the playing order in the Animation Pane (usually located just above the animation you are setting the timing for). To delay the animation effect from starting, click the Delay up arrow to the number of seconds you want. To change the speed of the animation effect, set the Duration to the level you want. 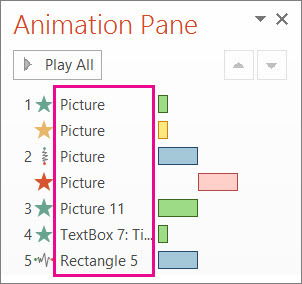 To watch how the animation effects work together, click Preview on the Animation tab. When you work with multiple objects on a slide, it can be difficult to differentiate each object and their applied animation effects from one another. In the picture, below, the default object names don’t provide much of a description so it’s hard to tell which object has what animation effect applied to it. 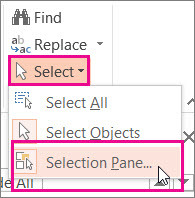 To change the default names of the objects, on the Home tab, click Select, and then click Selection Pane. 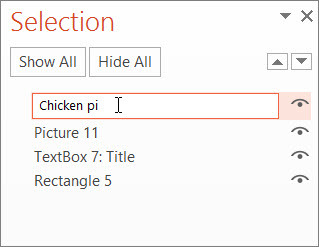 In the Selection Pane, double-click the default object name to open the box, and type a new name for the object.